453 E. Red Bridge Rd. Neighborhood Hardware is the extension of a real-life, good old fashioned hardware store operating in the Kansas City area since 1971. Originally founded by Ken Euston, the stores are currently run by one of his sons, Kevin. The family owns three locations other than Euston Hardware at Red Bridge including Euston Hardware in Prairie Village, Kansas, Waldo Hardware in Kansas City, Missouri, and Pack’s Hardware in Smithville, Missouri. Kevin and his family, including his wife Kathy, all play a part in one of the Kansas City area’s most treasured retail establishments. Walk into any of the stores and know that you will find a cheerful greeting and expert advice on just about any hardware, lawn or home improvement topic you can think of – Just like the good old days of the Neighborhood Hardware Store. 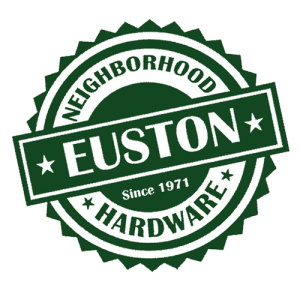 So if you’ve grown tired of the mega-store and all that it’s not, then you can be comforted in the fact that at Euston Hardware we strive to provide the same great friendly service and selection of over 65,000 products that is at the heart of the neighborhood hardware store of old. Come on by anytime, just to chat, find how to fix what needs fixing or to get that perfect gift for someone who’s handy.